Last week we experienced a serendipitous moment. 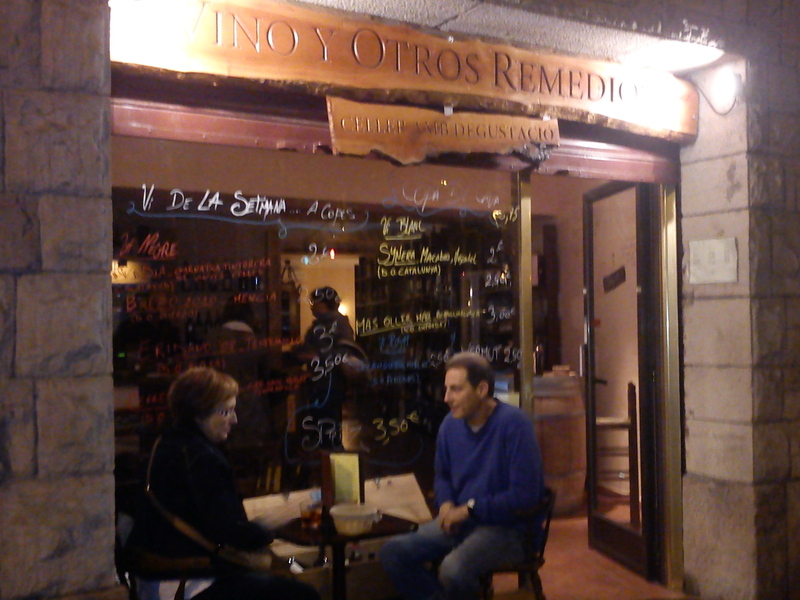 While browsing online for a nearby restaurant, we came across one with a curious name: Vino y Otros Remedios (Wine and Other Remedies). 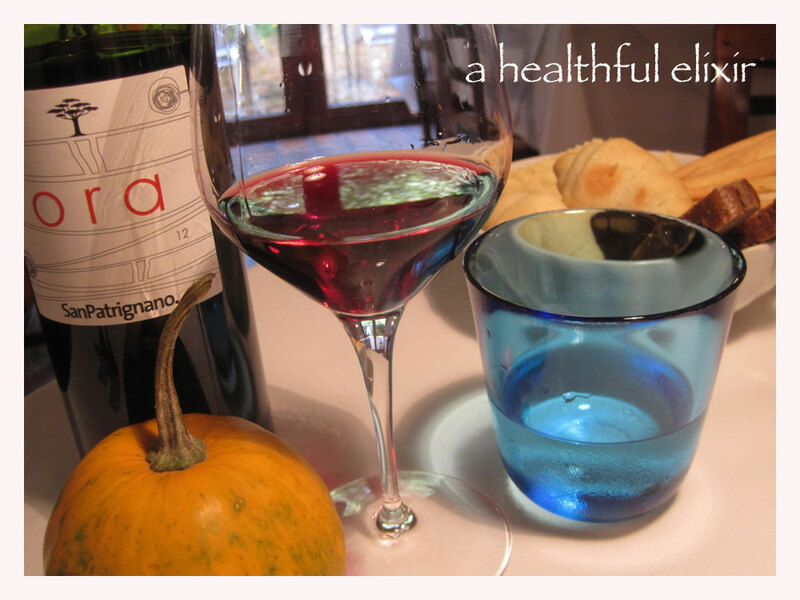 The name was intriguing with its suggestion of healing the body with great foods and wines, but it was the reviews that really sold us. We cross-checked a couple of sites. Yep . . . it looked like a winner. Since it was located only a block and a half away, we were out the door without giving it another thought. Barcelona is wonderful for tapas and small plates. There are many creative combinations to tempt the palate, so we were delighted to find that VyOR offered such dishes. We had a local cheese plate, which included a splash of concord grape jam. A little dish of salamis was delivered to our table, alongside a great glass of a Cabernet blend. Wow! Then Umberto brought out a triplet of olives. Large green meaty ones and oven-baked black salty ones from Sicily. “Normal” black olives were the third. We also ordered a plate of Scotch salmon, which came in bite-sized morsels—awesome! 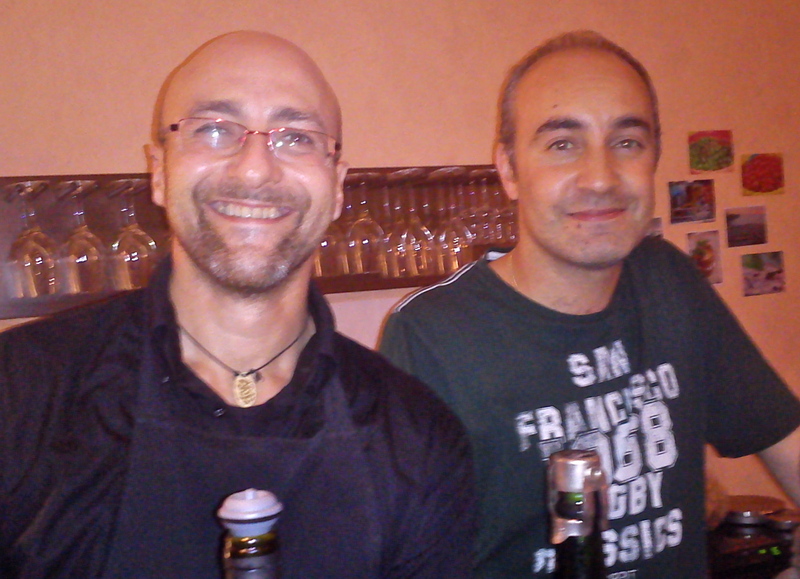 Now, while we were munching away on our yummy food, we were also talking with the owners, Umberto and Francesco. It turns out that they are both from very different parts of Italy, arriving in Barcelona to follow their passions. Umberto is from Puglia in southern Italy (the heel of the boot), while Francesco hails from Venice. We seem to have a knack for inadvertently finding Italians in other countries—not intentionally, it just seems to happen that way. It doesn’t take long to realize that the notion of a “small world” is absolutely true—and it seems to be getting smaller and smaller by the day. Less than a year ago, Umberto and Francesco opened VyOR and are doing quite nicely. 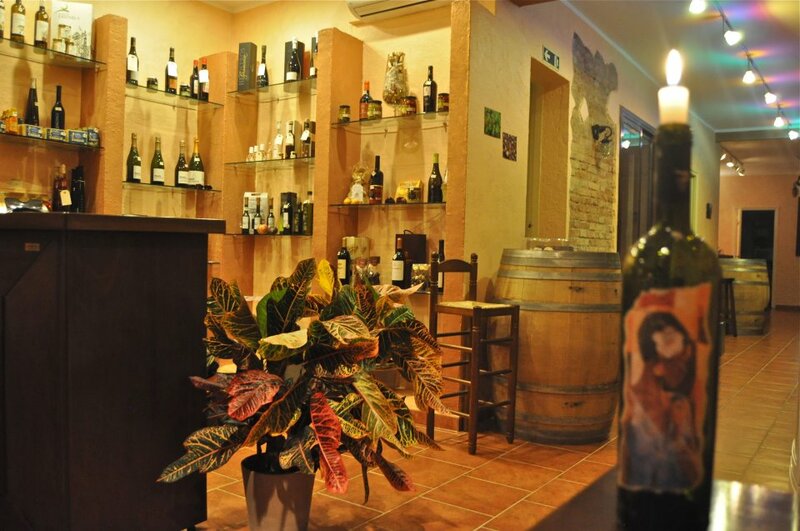 The restaurant is small, cozy, and casual. 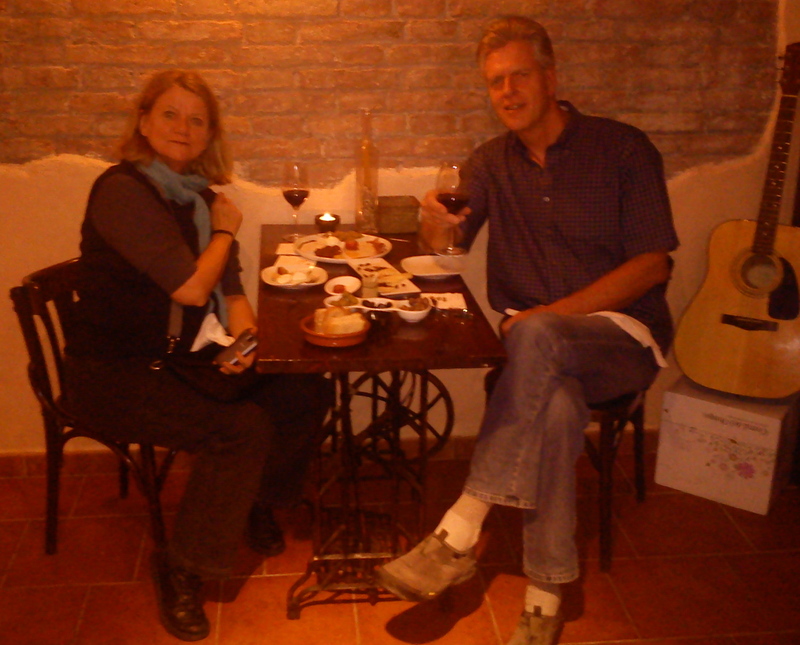 We lingered for a couple of hours over our tapas and wine before heading out. An unsuspecting couple dining out-of-doors gave us the okay for a quick photograph as we strolled away. How nice of them! We couldn’t resist snapping one last pic of the colorful scribbles of suggested foods and wines handwritten on the glass wall out front. Prev Post: Things Don’t Always Work Out!